Disclosure: This post contains affiliate links, and www.andreaswellnessnotes.com will benefit from actions taken on the links. I haven't added many new items to my wardrobe this fall and winter. But three items I bought, I can't imagine being without because I wear them all the time. 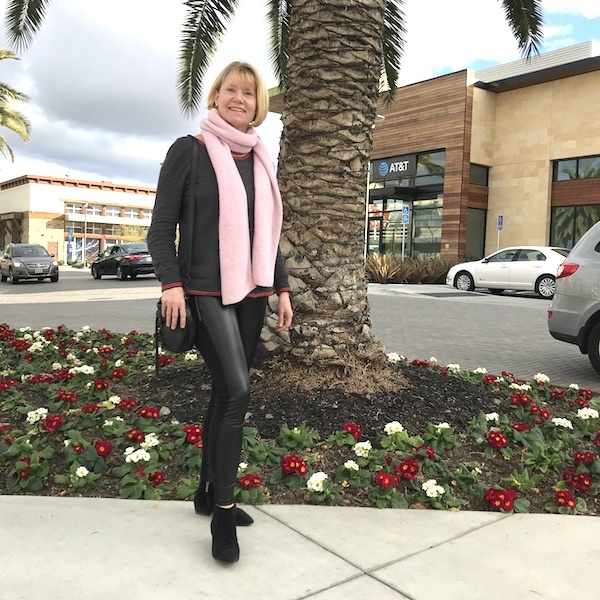 I love these inexpensive faux leather leggings just as much - or even more - then my much more expensive pair. I have worn them countless times - one may wonder if I own any other pants or leggings - and they are like new. The ponte back really makes them comfortable, more breathable and adds interest. To be honest, I originally ordered the sweater as a Christmas gift for my nephew's girlfriend. But when it arrived, I fell in love with it and decided to keep it and buy another one for her. It's become one of my favorite sweaters. It's loose but still has a nice shape, and I love the stripes and the heart. I know I've posted about the scarf before, but it's my absolute favorite, and I have to try hard not to wear it every day. I just love the color and the fact that it's so warm and comfortable. Questions: Which items have you added to your fall/winter wardrobe? What's your favorite? Why? Those leggings are fantastic. They look great on you. I bought a knitted dress that I absolute love, do easy to wear! Have Great Sunday! Thanks, Nancy! It feels so good when you buy something that you absolutely love, doesn't it?! I'm sorting through my wardrobe again and am trying hard to only add items that are perfect and that I'll love for a long time! It's the best feeling to actually LOVE the things you buy. And sometimes they aren't the items you thought you'd love so much....that's the funny part!! Yes!!! So true! The unexpected wardrobe workhorses make you feel the best! I got tickled that you said you try not to wear this scarf everyday. I bought - on a whim - a chunky knit, open weave, oversized sweater two weeks ago and it could easily become a uniform for me! I want to wear it everyday. It is so easy and warm. 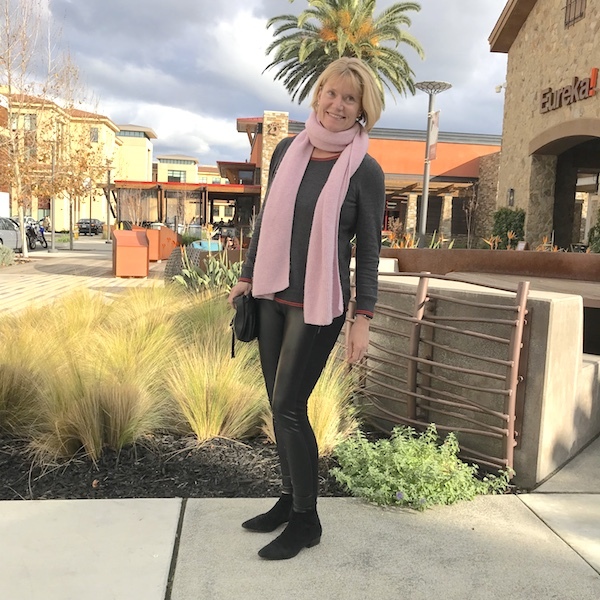 Love your pink scarf and how easy it is to pair with other pieces. Of course, your great faux leather leggings inspired me to bite the bullet and buy some, too. Great photos and really pretty graphic. Go ahead and wear that darling scarf all you want! You wear it so well. 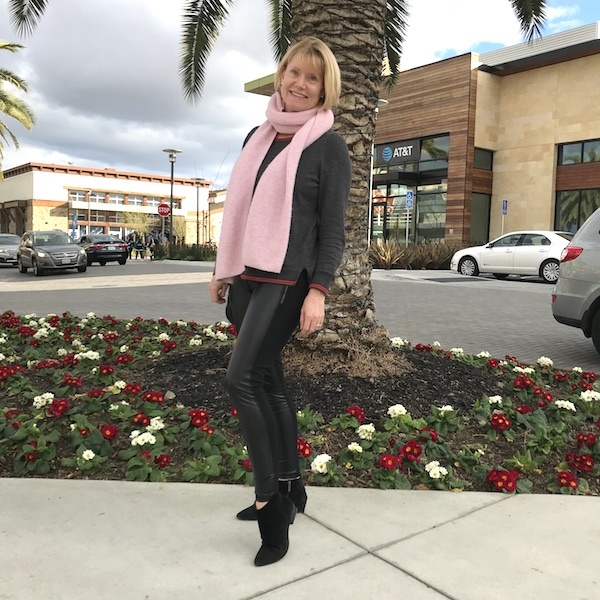 I have leather leggings and wear them all the time! They are so much more fun than regular leggings. Love that pink scarf too! Thanks, Laura! Leather leggins are indeed so much fun! The scarf is one of my best purchases in a LONG time! My new Thursday Moda Linkup is already LIVE! Come join it my friend! =) Thanks.